A friend of mine is a getting her doctorate a journalism school I won’t name right now. While everyone acknowledges that new media technologies are changing the nature of journalism, the school is primarily teaching the same subjects it always has. On the one hand, that’s important. Because kids will figure out how to use the internet both for research and presentation whether you teach them or not. But the elements of writing, interviewing, and telling a good story are important no matter what medium you’re using. And of course, ethics are of the utmost importance in making sure your audience can trust what they read/hear/see. But the tools of the trade are changing, and so it’s important to change with them. There should be some focus in journalism schools on writing for the web, producing mixed media presentations, and perhaps most importantly, how to find information online. The most surprising thing I discovered during our talk the other day was that my friend had no idea how to set up an RSS reader or why she would want to. I plan to write a comprehensive post soon on how to use Google Reader and why it’s important for journalists and news junkies to jump on the RSS bandwagon. I’ve been so immersed in technology blogging for the last half year that I’d forgotten that most of the world still thinks of the web as pages they’ve bookmarked or found through a search engine or portal. With that as a background, I was particularly struck by a post I read on Mindy McAdams’ blog today about building resumes online. She suggests that most young journalists looking for jobs today are expected to have some web savvy. So why are they handing in printed copies of resumes typed up in Microsoft Word? It doesn’t take that much work to set up a web page to showcase your work with clips, links to stories that have appeared online, and a resume in HTML and PDF formats. If you’ve got a blog on a relevant topic, put up a link. Whether you send your future employer to your home page or not, odds are they’re going to Google you anyway, so give them something good to find. 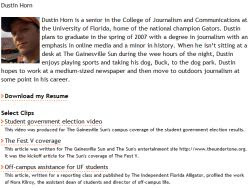 McAdam’s blog entry includes links to a number of good examples of web sites and resumes by reporters and photographers.